Soft drink trends have changed over the years. People no longer simply want a good-tasting beverage. Consumers expect other factors to be at play, such as how the drink affects their body. Patrons expect everyone in the soft drink industry to step up their game. And understandably so. From the use of new technological advancements to soft drink preferences, today’s consumers expect more. People in this day and age are always seeking something different and new. Forbes says evolving consumers are looking for a unique experience. This could range from retail purchases to their lunchtime meals. And when it comes to their meals, people want more than what’s on the ingredients label. Beverage Daily says consumers want to see, smell, and feel their drink of choice - not just taste it. One 2019 beverage trend by Beverage Daily is consumers are looking for bright, bold hues in the color of their drink—think Naked Juice. They want the experience to be remembered and provide nostalgia at a later time - and possibly use the outstanding colors to post on Instagram or another social media platform. Consumers are looking for ingredients such as blue algae, beet, and matcha; these ingredients are both healthy and provide spectacular colors for your next selfie. Texture plays a major role as well. Is there froth at the top? How does this drink differ from others when it comes to how it feels on their lips as they take their first sip? These are the questions consumers are asking; another question raised is whether or not the drink is good for them. People are looking for healthy alternatives now more than ever before. In the Beverage Industry’s 2018 product development outlook, 62% of U.S. consumers said they’re looking for natural beverage options. And according to a report by Grand View Research, the segment is expected to grow at a compound annual growth rate of 13%. You simply cannot overlook this trend. People want to live a long and healthy life. One drink on the rise is kombucha. Markets and Markets say the global kombucha market is expected to be valued at $1.8 billion by 2020. Kombucha is a fermented tea drink; it has a rich source of probiotics and provides certain health benefits, quite similar to the benefits of tea. An example is KeVita, which is a kombucha brand acquired by PepsiCo in 2016 to better provide consumers with healthy alternatives. Offering options that take into account the demand for healthy alternatives may help your business thrive. When it comes to your workplace, providing people with healthy drink choices in your vending machine or micro market can boost company morale. Sparkling water is having a moment right now for today’s consumers. And these fruit-inspired drinks are sure to provide you a unique tasting experience while consuming zero calories. Aside from the rising demand for fancy coffee drinks, people are looking for an alternative to milk from an animal. For this reason, almond milk has been on the rise. The Starbucks Almond Milk Frappuccino brings both great taste and an acceptable alternative for individuals not interested in consuming animal-based products. Maybe bubbly or frothy drinks aren’t your thing, but you still want to try something new with good nutrients. If so, Propel drinks may be your answer. The Propel Vitamin Boost drinks include Vitamins B3, B5, B6, C, and E. And with only 10 calories per 20-ounce bottle, they are a great low-calorie alternative to other soft drinks. Now don’t get me wrong. Pop is still pop; it tastes great. And sometimes it’s okay to treat yourself. PepsiCo’s mini can option offers you the chance to satisfy your sweet tooth without drinking a full-sized can. Pepsi’s 7.5-floor ounce cans only contain 100 calories each. If the benefits of tea mentioned above, like providing probiotics, caught your eye, then you may want to check out some herbal teas from Pure Leaf. From Cherry to Mango Hibiscus flavors, there’s sure to be a healthy and delicious option for you. Athletes can now tailor their nutritional needs with great-tasting beverages. Variety is everything. People want choices. They want to choose between different cola flavors - and they want to know if it’s good for their body. 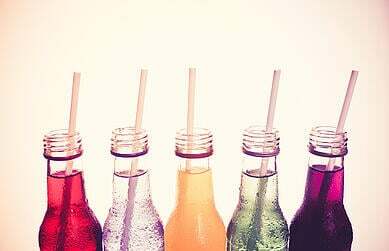 We’ve all heard the phrase, “Give the people what they want.” For soft drink consumers, they want the ability to choose between an array of exceptional products.